If you're in a Hong Kong primary school, it's now much easier to join a debating competition to build up debating skills and general knowledge before students reach secondary level. As with secondary, teams are matched according to locality, ability, age, and experience. To help get new coaches and students familiar with the format, there are well-attended workshops for teachers and students such as those shown in the pictures above at Wah Yan College Kowloon on Friday 23 September 2016 (top picture). The workshop, run by Winky Lo of Wah Yan College Kowloon, Joan Cho of Diocesan Girls' School, and Jessica Wong from Carmel Secondary School, featured a live debate on the motion that corporal punishment should be banned with adjudication feedback and Q&A. 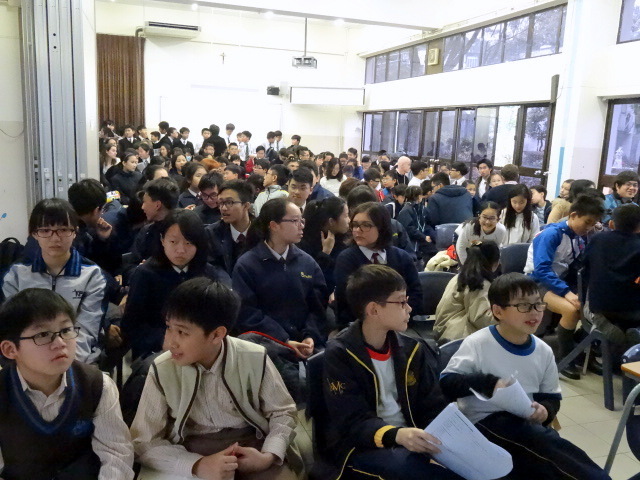 HKSSDC Primary Debating has three rounds each year and all teams winning at least two of the rounds qualify for the Grand Finals held in late June. Teams in the Grand Finals are awarded a trophy for either Champion or 1st Runner-up. There is also a trophy for best speaker at each Grand Final debate. Each primary school can have up to two teams and coaches can schedule debates by the deadlines on days to suit themselves to avoid busy times in their school calendars. Workshops in 1819 will be similar to the ones held on 22 September, 3 November, 2017 and 2 February and 24 March 2018. ​There will also be the 1819 HKSSDC Primary Debating Challenge debating tournament for primary teams on Saturday 30 March, which around 100 debaters, parents and teachers will again join. Team entry and workshops are free. Please send an email to hkssdebating@gmail.com if you've got inquiries or if you're interested in having a team or two in HKSSDC's 1819 Primary Section.